← Buy Books Online Now at Columbia Press! There are a number of places to get the book now! 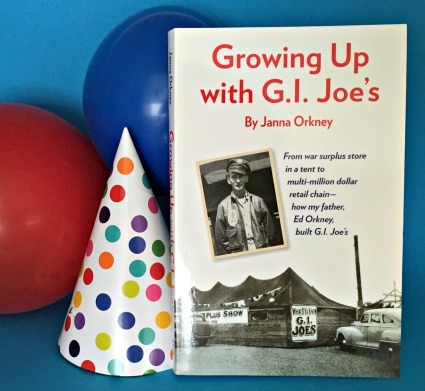 For Kindle e-book edition, Amazon will start loading Growing Up With G.I. Joe’s Thursday, November 12th. It is probably easiest to search Amazon for the book using mu name, Orkney, Janna. The paperback is for sale on Amazon, too, but as of today, they are temporarily out of stock, soon to be remedied. http://www.Powells.com offers the book and it is stocked in at least 2 stores – their downtown location and in Beaverton and probably more. You can also find a copy at Annie Bloom’s Books in Multnomah, and at the Oregon Historical Society store as well. And, of course, you can order a signed copy from the publisher, http://www.ColumbiaPress.net, and request a dedication from me, too. So, if you want the book, it is out there! Let’s keep on reading! 1 Response to Where is the Book? Would like to get a copy of this book, any locations in Vancouver to buy it? Costco? Editor: Currently you can buy the book at 3 Powell’s locations in Portland, or online at Amazon.com or http://www.ColumbiaPress.net. which is something that bookstore buyers want to know.